The Metcalfe Park Community Action Team is partnering with Groundwork Milwaukee to expand a project in which young adults build rain gardens throughout the community. To gain support for the project, three community groups partnered with 17- to 25-year-old neighborhood residents to build a rain garden in the community garden installed on a city-owned vacant lot across from the Wesley Scott Community Center, 2800 W. Wright St.
“This is the first time that we have been able to get youth some jobs in our community to revitalize,” said Sara Bauer, site coordinator for the Building Neighborhood Capacity Program (BNCP). It took three days for the six young adults to finish the rain garden. Kimberley Bounds, 23, worked on the rain garden after her boyfriend got her involved. “I like it. This is my first project. The workout is nice and I like that it’s in my community. I live down the street, and it’s some good part-time work,” she said. “The kids here have an awesome work ethic, so what they need is opportunities. We want the whole city and all of our cross-sector partners to think about doing the same,” said Cross. The Metcalfe Park Community Action Team (MPCAT), Groundwork Milwaukee and BNCP spearheaded the rain garden project. 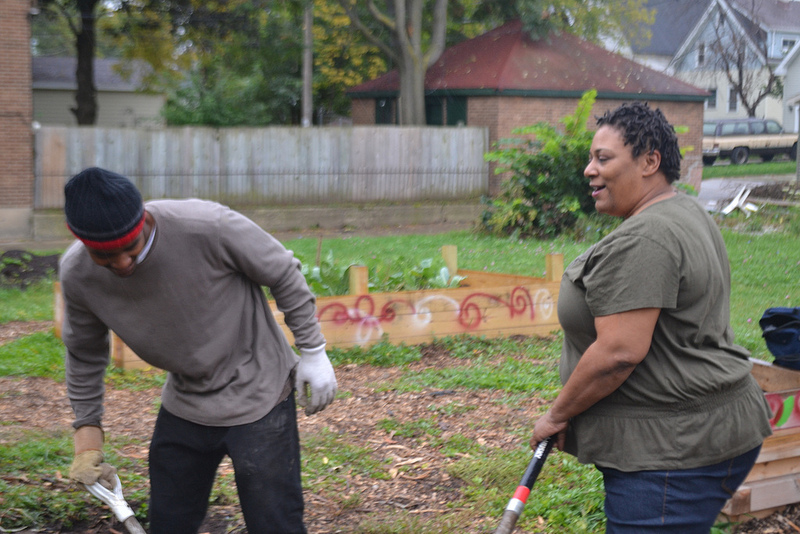 Funding for both the community garden and the rain garden was provided by the city’s Neighborhood Improvement Development Corporation, Groundwork Milwaukee and BNCP. Nick DeMarsh, operations manager at Groundwork Milwaukee, said that the group has gone door to door in Metcalfe Park to identify individuals interested in putting rain gardens in their front yards. The new grant would provide funds for materials and as well as stipends for young adults hired to build the rain gardens. “As we probably all know, issues of unemployment in Milwaukee are pretty strong. So we want to create employment opportunities and will hopefully open up more for these guys in the future,” DeMarsh said. Bauer said MPCAT has been looking for community residents between the ages of 17 and 25 for all of the team’s projects. The project is also intended to help create community awareness about the quality of Milwaukee’s watershed, which is an area of land that drains to a stream, lake or wetland. To build the rain garden, workers removed the grass and planted native Wisconsin species with very long roots that can penetrate the primarily clay soil. The plants can survive droughts by reaching into the water table. They also keep rainwater from going into the sewers and ultimately the lake. “These plants require a lot less maintenance as far as watering, so it makes what was once a vacant lot a self-caring system that also has a lot of other benefits such as bringing in wildlife that utilize parts of the plants for food and for habitat,” DeMarsh said.